Following their second consecutive loss to the Los Angeles Dodgers in the National League Championship Series, the Chicago Cubs find themselves down 2-1 and, for the first time, only the third most likely World Series Champion. Earlier yesterday, the Toronto Blue Jays fended off a sweep by the Cleveland Indians, living to fight another day. The result of both games is that the Indians and Dodgers are now their respective league's favorites to compete the 2016 Fall Classic. 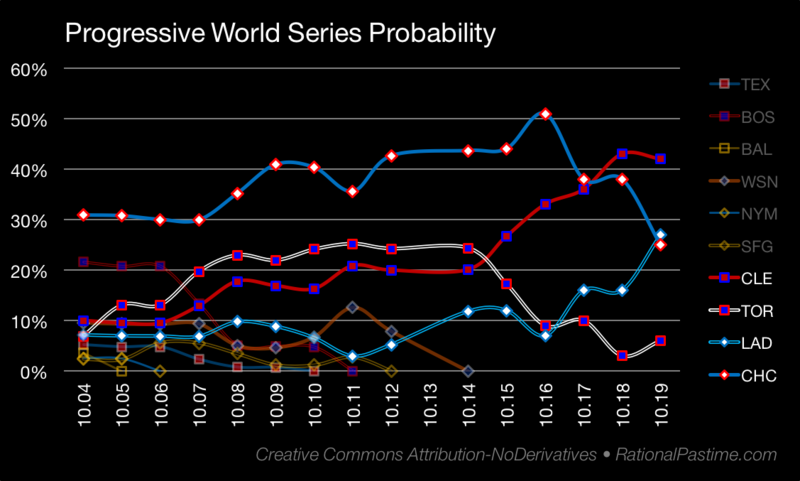 Despite their loss, Cleveland retains its spot on the top of the heap with a 42% World Series expectancy. The Dodgers set their own playoffs high water mark with a 27% chance of winning it all, good for second among the four remaining teams. 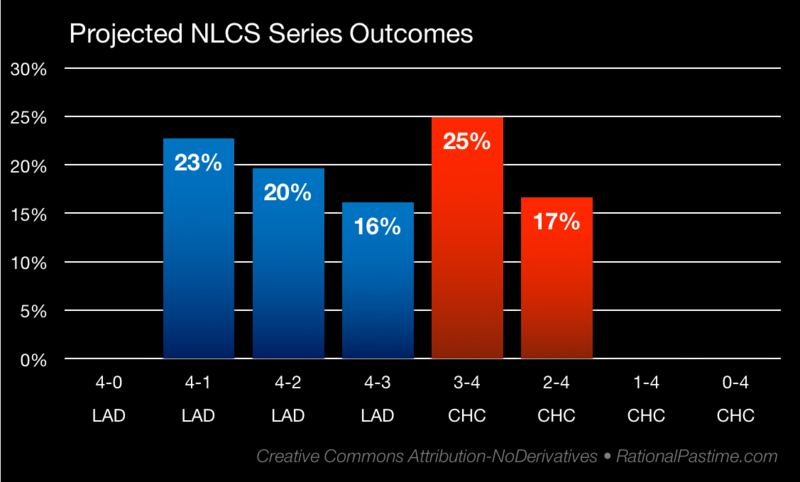 The Cubs' chances have dived over 25% in the last two games with their NLCS losses. 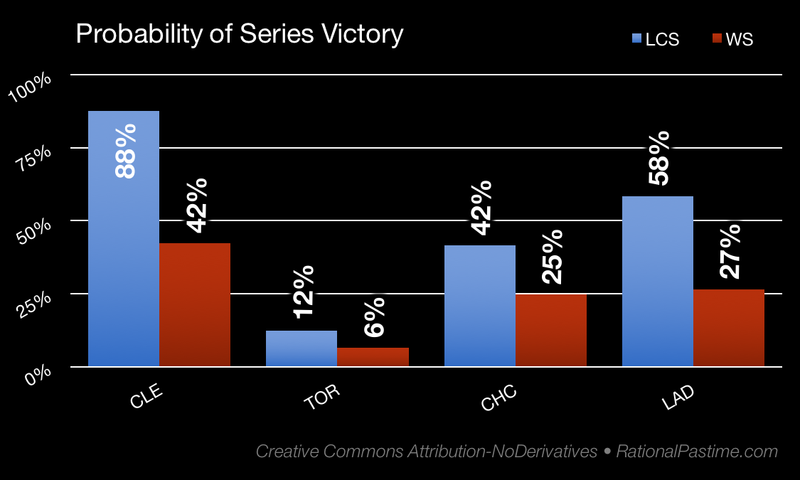 Finally, the Jays have improved their position to 6% championship underdogs. 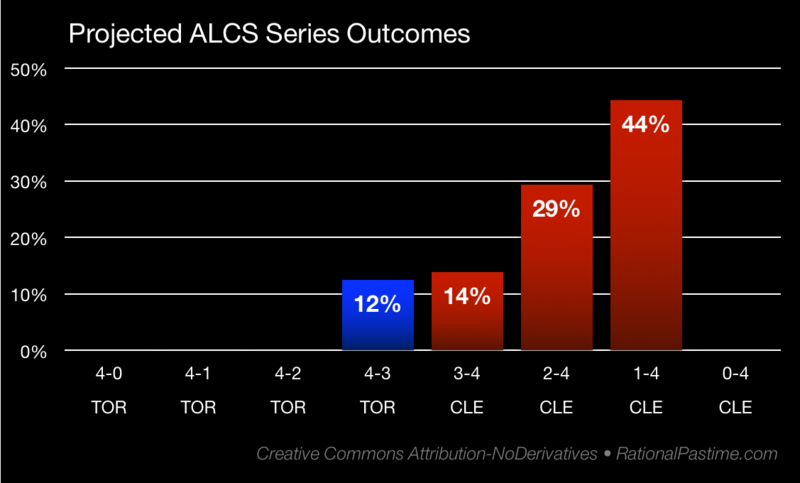 Toronto is still a distant 12% shot to accomplish the nigh-unthinkable and win the ALCS after being down 3-0. Conversely, my simulator picks the Indians in 44 out of 100 simulations in today's affair. Toronto sees a slight boost in their game-to-game odds thanks to their win yesterday, which boosted their RPScore and lowered Cleveland's. With their 2-1 lead in the NLCS, the Dodgers are the favorite to advance past the Cubs for the first time. Their most likely opportunity would be to win-out in Los Angeles, whereas Chicago's best chance is to force a seventh game at home. All four teams are once again in action, with one still on the verge of elimination. Check in tomorrow to see how today's results affect their chances.